Gary, David (and now Mark) and I don't have offices in the sense that we get up and drive or take the subway to work each morning. It's the year 2015 for crying out loud! It's all about the virtual office now! Skype and Slack! To hell with human contact. That's so 2014. A couple of people in the comments have asked to see our work areas so we'd thought we post them. It's easier than writing an actual blog post. Gary is the only one of us that doesn't work at home, but we still make sure he's deprived of human contact. David's office looks suspiciously clean. Mark wins for having the coolest office. My excuse is I just got done moving and all my cool stuff is still packed. Yeah. That's what I'm going with. Yeah, I know. Not that exciting. Not sure what you were expecting. 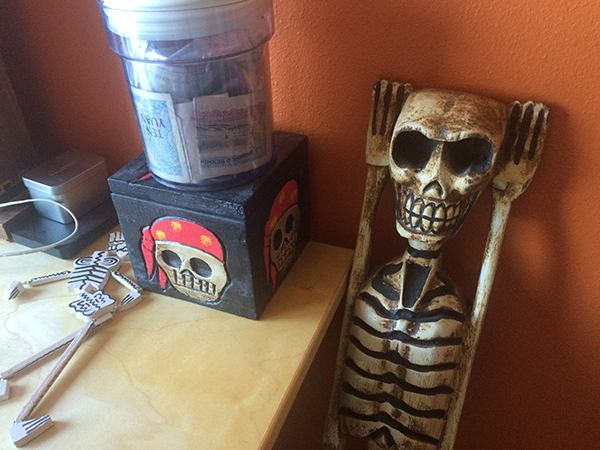 Ron, you win just because of the little Guybrush voodoo doll on top of the pirate box! Nice post. That you guys respond even to such simple things like "Can you show us your work spaces?" just shows how good the developer/backer connection of this project is! Another thing @Ron: Just wanted to remind you, that you wanted to post Information on upgrading the pledges here on the blog after your move! Anything on that would be really appreciated because I too want to Upgrade my pledge! Yeah, I should have some info about that soon!!! Mighty, mighty cool stuff!! - thanks guys for listening to comments and taking the time to do these snapshots! How did you take a picture of the post before making the post? Burn the witch! I like how you think! :-) I'm now using the matches with the gasoline I found on Monkey Island! 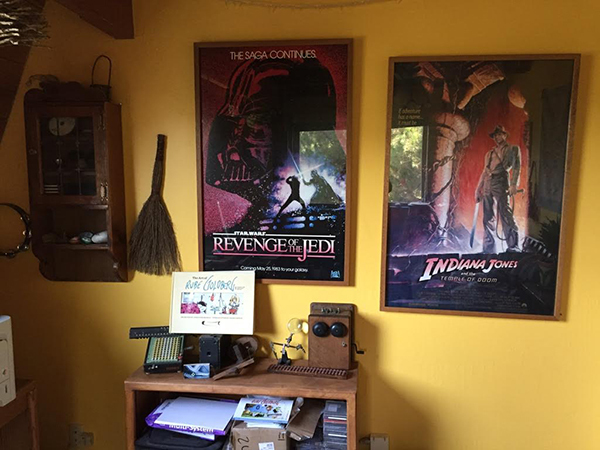 Ah, you missed the best parts of my office, including the Indiana Jones and the Temple of Doom, Revenge (sic) of the Jedi, and Zak McKracken posters! And yes, it's definitely suspiciously clean. I showed Annie the photo and she immediately looked under my couch for the big pile of papers and junk (and found it). Especially since "Return of the Jedi" made never sense to me: Return where? From wehre? How many return? Did some stay? I'm just happy that Lucas isn't messing up the new films! I'm just spitballing, as I haven't researched any of it, but I kind of felt like "Return of the Jedi" actually had a dual-purpose meaning. In a general sense, it was like "Luke is returning from training in Dagobah" which had sort of already happened, but then it also had the meaning of "Vader was a Sith, and in order to save his son, has returned to the side of the Jedi". Ah well, that could all be wrong and I don't pretend to be an expert on the matters -- just some theories. Return of the Jedi: The Jedi had been marginalized almost forgotten and Luke was their return. Revenge of the Jedi: Screw you for cutting off my hand!!!! Gotta love this blog for side-discussions like this! I mention something about Revenge vs Return in the upcoming podcast... stay tuned! I just came here exactly to let you know you win one internet for having a poster with the original title of the "Jedi". Way cool! Michael Land is the audio engineer and composer for Monkey Islands 1 & 2 (and many other Lucas* games which I don't know). In other words, you liked the music for MI 1 & 2? Blame Michael Land. Very nice and cosy! I'm surprised you guys don't use bigger screens and multiple monitors! Just a laptop? Macbook? Wow! Also, you guys must have soms of the best and coolest collectoritems around, ik it comes to games like Maniac Mansion, Zak mckracken, Monkey Island, etc. I'd love to see more of those! What are you talking about, Ron? No cool stuff? You've got a Jolly Roger and an action figure of Guy Brush. All of my clutter is just an embarrassing attempt to compensate for the lack of such unattainable--and impressively understated coolness. That should be obvious. Is that the really the screen Gary draws on? Surely he's got a nice big monitor for his pixel art? If there are pirates on it , it can't be wrong. Is a Rube Goldberg contraption that David has, or just a bunch of junk? Do you draw on that laptop, Gary? No fancy tablet? Wow really nice 24 hour clock! Wooow.... I like Ron's room the most!!! Look at that cool guybrush voodo doll. I always imagined that Rons room would have cool stuff like that doll.. I expected more monkey island stuff .... What is inside this pirate box Ron? I'm in all that piracy stuff and I started to read tim powers-on stranger tides... I read on your grumpy gamer post about it and it sounded great.... I love that book! Greetings from Montenegro! The box contains the secret of Monkey Island. What else could it be? I really dig how David and Mark has so much wood in their offices. It makes it look so cozy. Gary's office look so proffesional. And Ron's office looks like my own, just with more Mac- and pirate-stuff. I love our home... lots of wood throughout. Wood is nice. My sincere thanks for keeping the fans and your backers up-to-date with this awesome project! I have backed couple of KS projects, and they have failed to keep my *emotions* attached (being lazy with their updates). 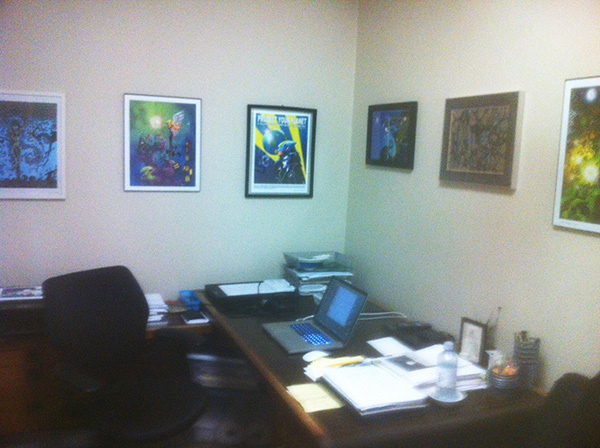 Something silly like seeing your desks is fun and great and dandy.... I still feel like "investor" even if I am practically doing nothing but enjoying reading/hearing these blog posts. PS: mailtron3000 is a must for me and perhaps you could occasionally also send KS emails to the ones that haven't subscribed and miss the highlight of development. What about the Thimbleweed Park Podcast, today? How do Gary and Ron get any work done with only one display? I used to have two monitors and I found that it was actually hurting my productivity. I was more likely to keep a browser open and get distracted. Having one monitor keeps me focused. And now the same for the desktop screens, please. That's been a 25 year search for me! Nice places to work!! Ron is right, nowadays the work reaches the worker, not the opposite! 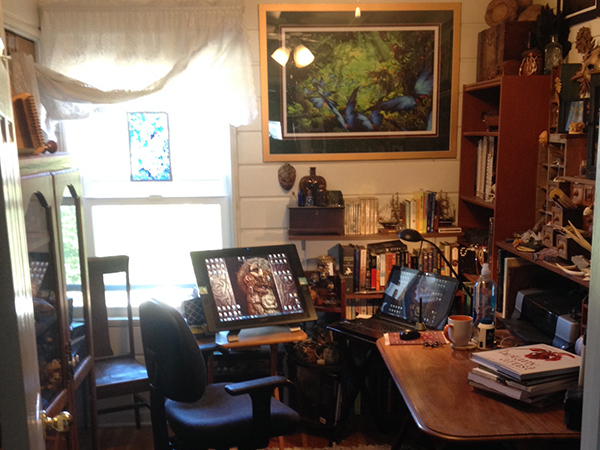 Gary Winnick: nice office! Every picture in order, aligned and equally spaced, confortable. It's the best office I've ever seen! 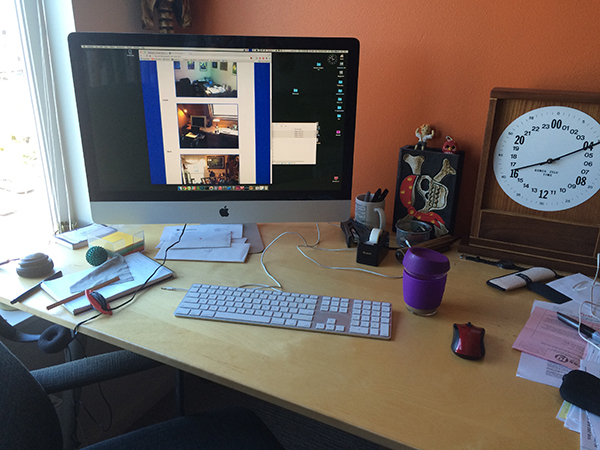 Ron Gilbert: beautiful office, with the action figure of Guybrush, the skeletons that remind me of Grim Fandango, and that clock, is awesome! Now, it's the best office I've ever seen! 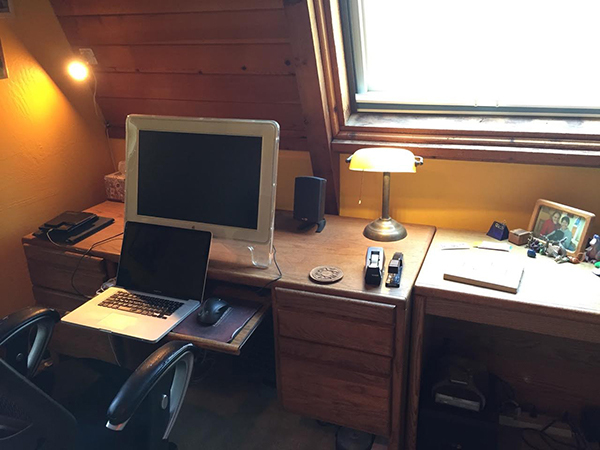 Mark Ferrari: cool office! With every sort of art a human being can imagine! 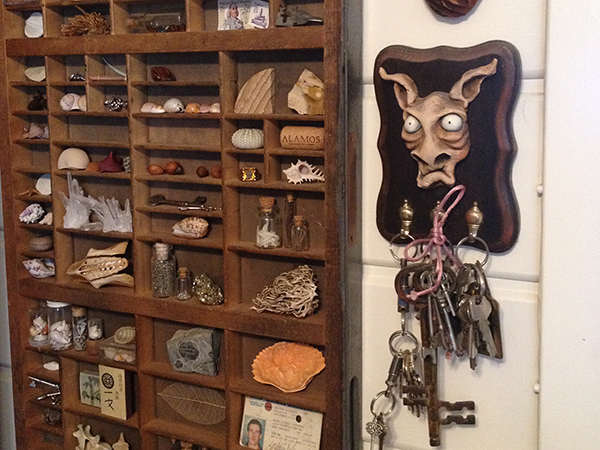 And that bookcase full of objects worthy of Indiana Jones, not to mention that big key useful to open a certain pyramid... then substituted by a giant bobby pin sign! This is the best office I've ever seen! Definitively, it's the best office I've ever seen!!! It took me a moment to realise that Star Wars poster is with the Revenge title. I'd bet they're worth a good chuck of money in a mint condition. And Mark's office is tres cool.